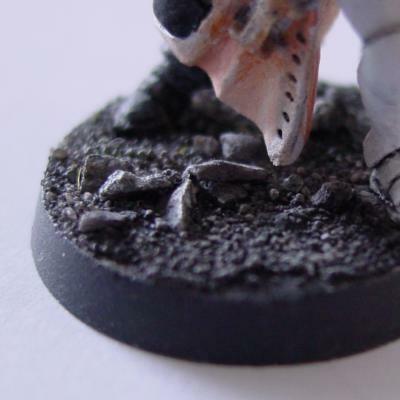 This page should be a complete reference of all the different things that you can do to your miniature bases. Of course some things are not (yet) covered here e.g. concrete, wood or painted bases. If you have own pictures and descriptions of these bases I would like to include those here. This is an example of the old default green base. 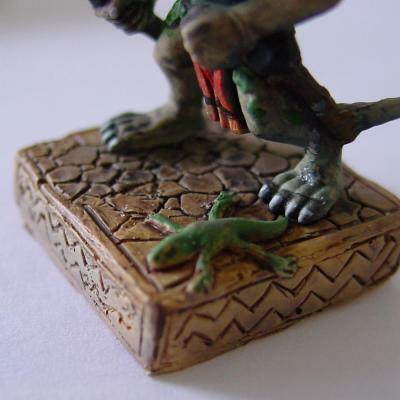 Ten years ago GW had all it's miniatures on this kind of bases. It's quite easy to make it. 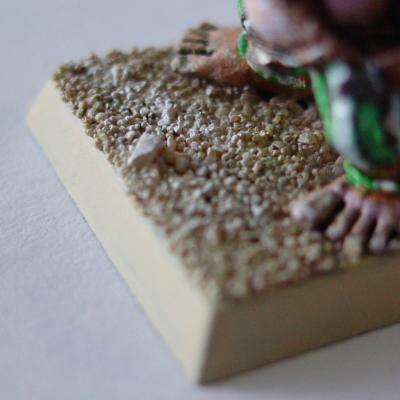 First paint the base with glue or thick paint and then dip it in sand. Any sand will do, but I normally buy bird sand. The sand for parrots is a little coarse, the sand for smaller birds is finer. After the glue is set paint the whole thing with green (e.g. gobo green) and then highlight with yellow. Making this base is very easy. 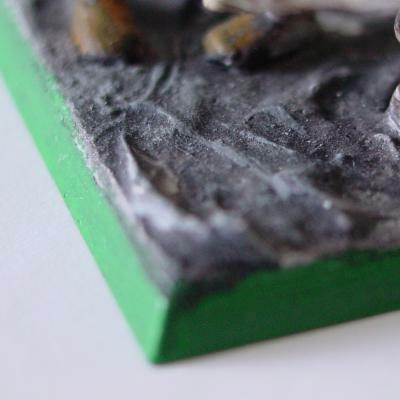 Make a "default green base" but instead of green use "bleached bone" and highlight with white. Easy but effective and perfect for your Khemri. The ash base is nearly the same as the desert base above. This time I used some larger pieces of rock from your friendly model-railroad shop. The colors are black, drybrushed with gray. Sometimes a combination can also look good. Here I used black, brown and some static grass. Here I used plaster to generate the rough surface of natural stone. The plaster was painted black and drybrushed with gray. For the ice base I used normal plaster. The plaster was mixed and then used to coat the whole base. I used some watered down blue color to give a little shadow effect. 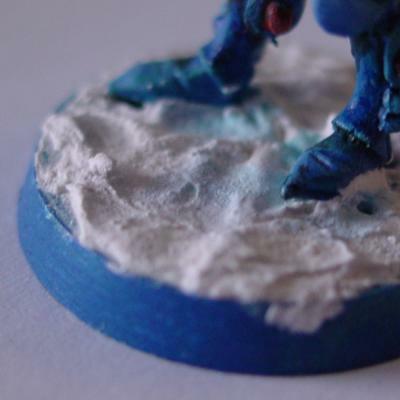 The side of the base is painted with ultramarine blue. Another ice base. This time I used two pieces of balsa wood and milliput to sculpt some old buildings. Covered with arcane runes of course. 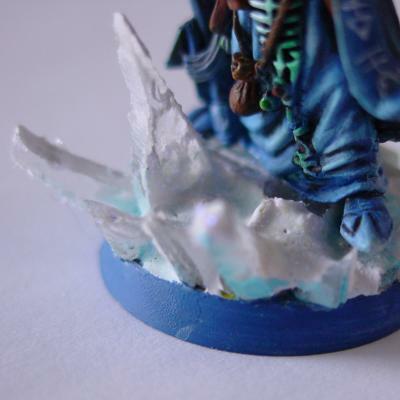 This time I used little pieces of acrylic glass to give the effect of sharp jagged pieces of ice. I got the acrly from my local home improvement store and cut it with a pair of metal scissors. You can further improve the ice effect by using metallic flitter that you can get from a cosmetic store. 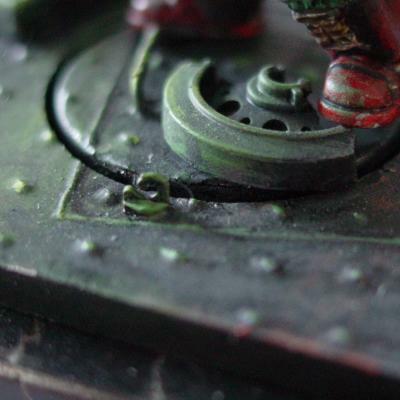 This is the base for my 2003 golden demon entry. First I used some aluminium foil that was placed between a paper with a square pattern and a soft cartonage. With a blunt tool I pressed a regular pattern in the foil (the squares helped). After that I pressed a rectangular line in the foil. The foil was turned around and glued onto the base. From an old model-tank kit I used some pieces and glued them onto the foil. The whole thing was sprayed black and then highlighed with green and orange. 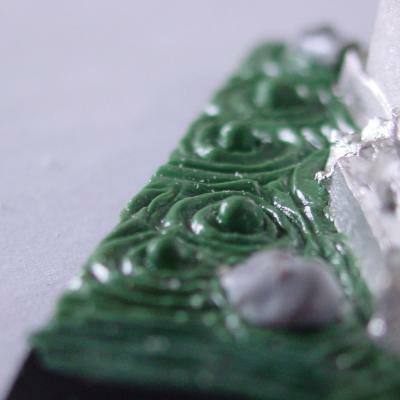 The blood base is sculpted with green stuff and some pieces from the zombie box. 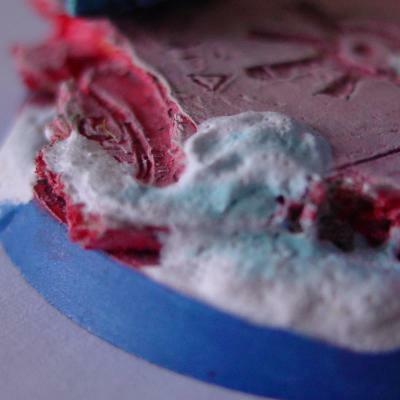 This base was first sculpted with milliput and then casted using silicone rubber and bi-resin. 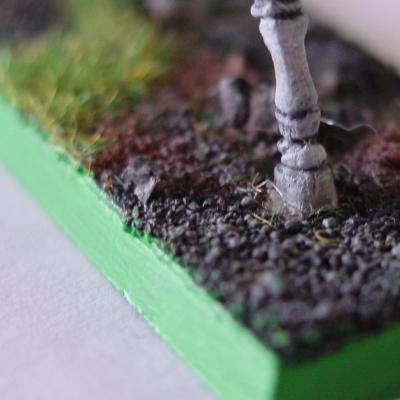 The base was painted in brown and drybrushed with "bleached bone" and white. Don't use miliput. Use plaster or something similar. Cast a small plaster rectangle 2x2cm and file it clean. You can make a really clean rectangle out of plaster where my milliput thing has round edges. Use a needle or small knife to scribe the details in the rectangle. This should be easy as plaster is quite soft. 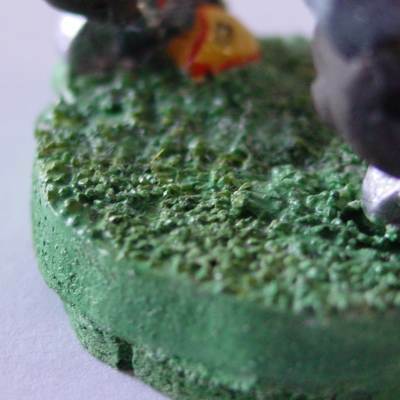 Paint the base. Color doesn't matter, you just want to seal it for the following step. I propose a last thin cover of oil or wax. Car wax maybe. Wait until finished and remove the base. Now you can cast as many of them as you like.